For the film based on this song, see Beer for My Horses (film). 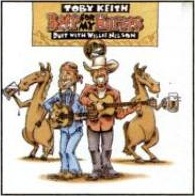 (2003) "Beer for My Horses"
(2003) "I Love This Bar"
(2002) "Beer for My Horses"
(2003) "Please Come Home for Christmas"
"Beer for My Horses" is a song recorded by American country music artists Toby Keith and Willie Nelson. It was composed by Keith and Scotty Emerick for Keith's seventh studio album, Unleashed. The song was released as the album's fourth and final single on April 7, 2003. "Beer for My Horses" received mixed reviews from music critics. The single reached #22 on the Billboard Hot 100, making it Keith's highest charting song of his career at the time. The song also peaked at #1 for six weeks in the US Billboard Hot Country Songs (one of two songs to stay that long at #1 for Toby Keith). Becoming Keith's 11th #1 hit and Nelson's 23rd and his first since "Nothing I Can Do About It Now" in 1989. "Beer for My Horses" was certified Platinum once by the Recording Industry Association of America (RIAA). The accompanying music video was directed by Michael Salomon and premiered on April 9, 2003. "Beer for My Horses" also made Willie Nelson the oldest artist to top the country charts at age 70. The phrase, "Whisky for me beer for my horse" is said in the 1975 film, Bite the Bullet, by Jan Michael Vincent. The song tells of a group of men who talk about how one used to catch criminals several generations ago. The music video for the song features Toby Keith, Willie Nelson, and Corin Nemec, as detectives hunting a serial killer, played by Gregg Gilmore. The detectives eventually convince Nemec to dress up as a woman to lure the serial killer and they end up capturing him. The video, directed by Michael Salomon, was shot in downtown Los Angeles and at the nearby Golden Oak Ranch, in Newhall, California. It is also the first video in which Keith does not actually sing. On March 4, 2003, the video was nominated for Video of the Year for the Academy of Country Music Awards. The 2008 film Beer for My Horses was based on the song, which was featured in the film. The film starred Keith and Nelson, among others. The song was also used in an episode of Lethal Weapon in 2016. It won the award for Video of the Year in May later that year. Stephen Thomas Erlewine of AllMusic found the song to be "absurdly anthemic". "Beer for My Horses" entered the Hot Country Singles & Tracks charts dated for the week ending August 3, 2002, spending three weeks on the charts as an album cut and peaking at #54. It re-entered at #60 on the chart dated February 1, 2003. On the Billboard Hot 100, it ended up peaking at #22. Along with "Who's Your Daddy? ", it was tied for his highest peaking song on the chart until "Red Solo Cup" beat it out in 2012 by peaking at #15. The song reached over a million in sales in April 2014. As of January 2017, the song has sold 1,178,000 copies in the United States. A film adaptation of the song entered production in mid-2008, and was released on August 8, 2008. The song is available as downloadable content for the game Rock Band. ^ "CMT : Music Video : Beer for My Horses : Toby Keith". cmt.com. Retrieved 2014-03-22. ^ "38th Annual Academy Of Country Music Awards Nominees | Billboard". billboard.com. Retrieved 2014-03-22. ^ Erlewine, Stephen Thomas. "Unleashed review". Allmusic. Retrieved July 26, 2013. ^ Billboard. Nielsen Business Media, Inc. ISSN 0006-2510. ^ a b Bjorke, Matt (January 24, 2017). "Top 30 Digital Singles Sales Report: January 24, 2017". Roughstock. ^ "American single certifications – Toby Keith – Beer for My Horses". Recording Industry Association of America. Retrieved February 15, 2013. If necessary, click Advanced, then click Format, then select Single, then click SEARCH. ^ "Toby Keith stars in "Beer for My Horses" movie". September 9, 2006. Retrieved 2008-07-08.